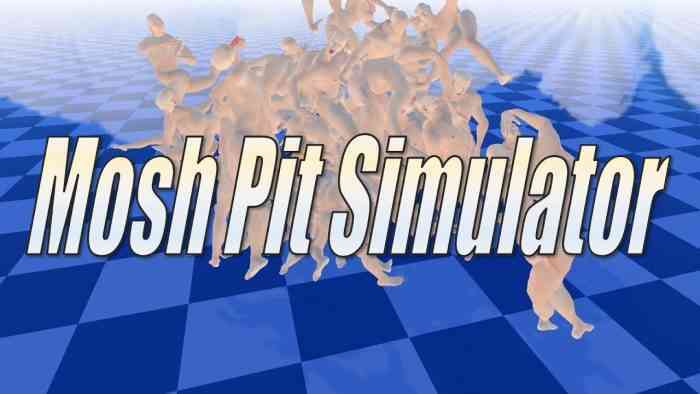 “Fever dream” is the only phrase that came to mind when I saw the story trailer for Mosh Pit Simulator. The title says “story trailer”, but I don’t see a story. There’s a premise for why the game looks crazy, but story might be the wrong word, not that this game will be in need of a strong story. Mosh Pit Simulator is a “physics” based VR game that allows players to [I have no idea how to finish this sentence]. Players live and breathe chaos in MPS. It appears that anything in the players’ path will be subject to their destructive will. Just watch the trailer and see why I cannot describe what this game is. The trailer opens with the developer Sos Sosowski dressed up as a (mad) scientist talking about removing bones from the human body. After that we are hit with 2019’s single greatest song. From what I can tell, players are able to attach things like rockets to other objects. A rocket-propelled whale can be seen flying across the screen at one point. Another shot features a helicopter with various objects used as wings. The player can also use their hands to climb almost any surface like a spaceship for instance. The video above is a chronicling of Mosh Pit Simulator’s evolution(?) from 2015 until now. This also features a hot, bumping track. The video focuses on the physics and behaviour of the naked husks in MPS. The only thing about this game I can say with confidence and certainty is that it is available on Early Access right now. Try it out and melt your brain. What do you think of Mosh Pit Simulator? Let us know in the comments.